I was sent this information graphic today and was struck by how effective it is. There is something that resonates with me. It puts your brand at the center of the page and graphically shows you how everything encircles and supports said brand. The guys at the site provided this fantastic embeddable graphic below for you interactive pleasure and I just had to share. 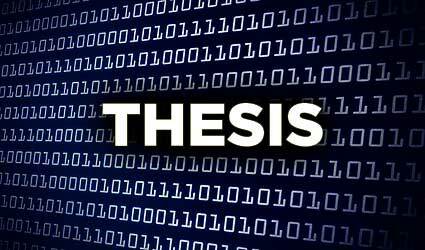 One of the tools that I use is Chris Pearson’s fantastic Thesis WordPress theme framework. In an effort to contribute back to both the Thesis and WordPress communities I have documented how to embed the Next-Gen Gallery plugin to your header, or banner image and place your logo above it. This functionality allows you the ability to have your banner image change how you like it beneath your logo at the top of your website. If you would like a variety of images in your header beneath the logo/type and manage them in a central location. Once the initial programming and configuration are setup it’s all image management after that. You may have clients that would like the option of changing their header image on their own and this gives them that option. 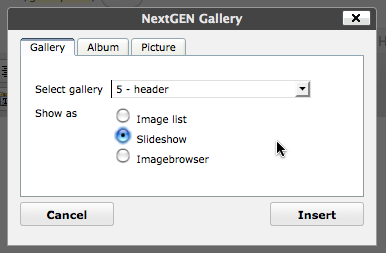 You will need to have WordPress, Thesis, and Next-Gen Gallery (NGG) installed before proceeding. Once everything is installed we are ready to go. First you will want to determine the size of your image, or header. What is that dimension in pixels? You will need this for both creating the image and for settings inside of Next-Gen.
Once you have the width and height of your header determined it is time to create/optimize your images that you intend on using. For our purposes of this tutorial the size of our image/header is 857 pixels wide, and 150 pixels high. We used Photoshop to create a layered file containing all of our images so that we can position and scale them within the size constraints and save out the multiple versions of the file. You may want to import your logo, or typeset your text now, to position it on top of all the images so that you can determine the static position that the logo/type will present itself. Now that the images are prepared its time to prepare the logo/type. You want to make sure with each and every image layer you have saved out that your logo/type is in the position you want it to appear on all images. 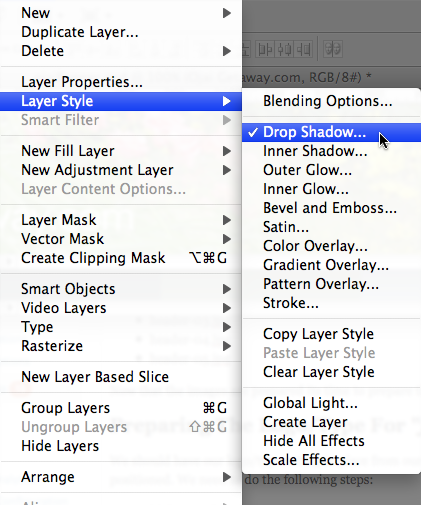 Select your logo/type layer then select the layer/layer style/drop shadow inside the menu options of Photoshop. 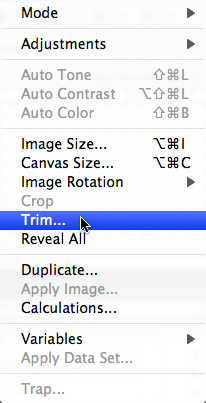 Adjust the settings to your liking and you should see a drop shadow from your logo/type on top of the image. Once you are happy with the shadow its time to save out the logo/type image. You should turn off all image layers so that you only see your logo/type and shadow. You should now have a much tighter logo/type that still has the shadow present. 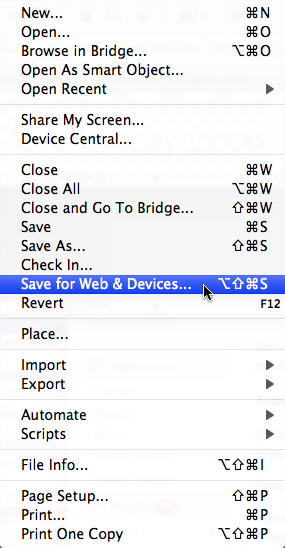 Once presented with the save dialog window you will want to set the following parameters for your file. 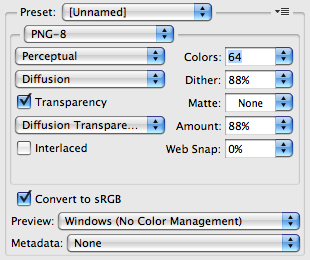 Once your settings are how you like them, save the file with a distinguishing name. 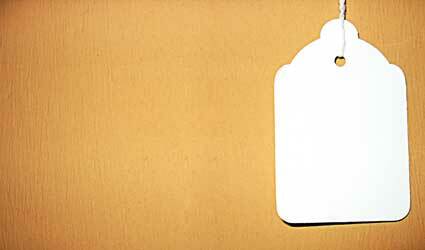 You can now FTP that image to your webserver. Now that the background images are created and uploaded into NGG, and your logo/type image is uploaded via FTP its time to get busy with the custom.css, custom-fuctions.php, and NGG settings. The method presented below is our “hack” to making this combination of plugins and technology work. If you have an easier/simpler way to do this, please share! We are always open to more efficient approaches—who isnt? 🙂 That being said, here is what we did. The next step is to upload the images you previously saved. These are the background images, not the logo/type you saved. If you look at the set of tabs at the top of the screen you will see an Upload Images option. That is what you want to select. 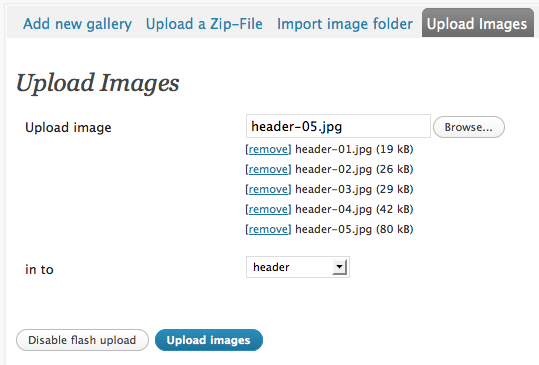 You need to click on Choose File and proceed to navigate to all your images and upload each one. Once you have all of the images listed, you should then select the proper gallery from the pulldown menu where it says Choose Gallery in the pulldown menu. Once all your images are listed, your gallery is selected it is time to click Upload Images. This may take a few seconds depending on how large your images are so be patient. Once the upload is complete you will see a confirmation at the top of the screen. 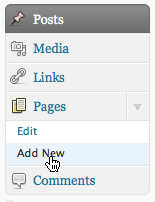 Now click on Manage Gallery under the Gallery admin menu on the left side of the page. 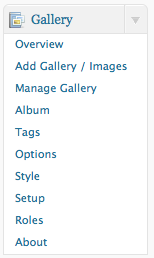 You should see your gallery listed under the Gallery Overview page. Click on the title to proceed to edit the gallery content. At this point you want to make sure that all the images you uploaded are present. If not, go ahead and add what you need. Now you want to confirm that the slideshow and the technology needed to run it are in place. 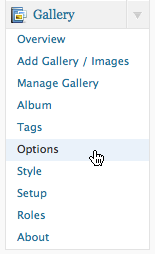 You do this under the Gallery/Options menu item. Of primary concern is the tab titled Slideshow. You need to look at the first option under this tab: Path to the Imagerotator. If the path is not already filled in, click the “search now” button just to the right. This should take care of things. If not, you may need to get JW Image Rotator from Jeroen Wijering. Follow the instructions and return here and click the “search now” button again. The way we tested the slideshow was to create a test page, insert the slideshow, then preview the page. I then give the page the title of Gallery Test in the title bar, then I click and icon in the top row, right. You can see it here in the screen capture. Once I click that button I get a dialog box that lets me select from the pull-down menu the slideshow I want to insert, and lets me determine how I want to display the images—in this case a slideshow. This is the code the NGG plugin uses to insert the slideshow. Now the code is in place I click publish, then I click preview to see the page and if the slideshow is working as I want it to. If its not you need to go back and double check your settings and that you have to get JW Image Rotator from Jeroen Wijering. Assuming the slideshow test is working as you intended in your web browser, the next step is to look under the hood at the code being generated to display the slideshow. You will need to find this code, copy it, and then paste it into custom_functions.php to help build your new header. Fortunately I will show you my code here and you can copy/paste to make things work. When you are looking at the webpage with the slideshow working as it should, you should “view the source code” to see the syntax that is making everything tick. One thing you may have noticed is that your slideshow is a different size than the header you want. Don’t worry, we will change the size in the code. NOTE: Be sure to change the domain to your domain name in the paths above. The key here is to position: relative; and to use negative top margin. This is what will get your logotype to appear on-top of the banner. Be sure to add the z-index in for good measure. 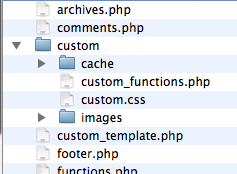 Be sure to save your custom_functions.php and custom.css file and upload via FTP and test, test test! This has been one looonnnnggg tutorial and if you have read to this point, you are both patient and persistent. You can see the banner that I have based this tutorial off of here at OjaiGetaway.com which is a web site in progress. Do let me know if you have any questions about this process. I will help as best we can. So I have had an iPhone for almost a month now and I have thoroughly enjoyed it. There are some things I have a beef with and I found a website that helps collect and lobby Apple for fixes. 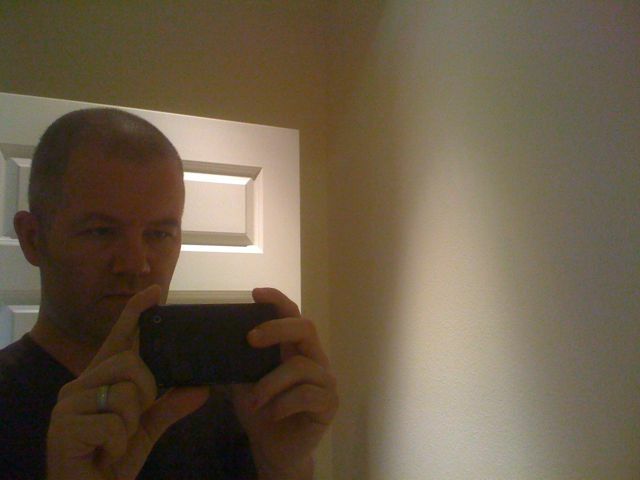 Today I am writing this post from my iPhone with a wordpress application. This is interesting to type a post on the tiny keypad iPhone offers. A bummer is that I cannot insert a photo with my post. Perhaps I need to lobby the makers of this application? In any event, the ability to post via mobile is nice and may increase posting volume. We shall see. Whoops, spoke too soon. 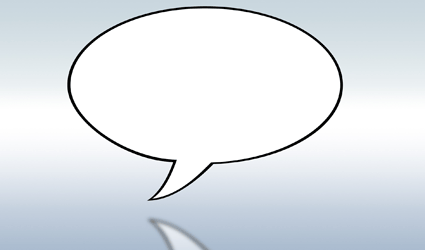 I can add a photo at the end of a post. Here it is.